Long known as the twin cities of Hyderabad and Secunderabad, Hyderabad, today, is probably better divided as the twin cities of Hyderabad and Cyberabad, the old and the new. One steeped in history and islamic influence, the other a centre for dessert cafes and everything swanky and hip to cater to the burgeoning IT population. Home to one of the best international airports in the country, Hyderabad could well be on your itinerary as your next layover or that short business trip. So, here is a quick guide on what you could do if you find yourself in the city of pearls for a few days. If you want to eat like a local in Hyderabad, then it isn’t just about the biryani or the haleem, you start your day with an Irani Chai and a side of Osmania Biscuits at Nimrah Cafe. Located bang opposite the Charminar, this landmark is the starting point for many a walk in the old city of Hyderabad, be that a photo walk or a food walk. Just as iconic are Paradise and Pista House – ‘world famous in Hyderabad’ as one would put it – the former famous for biryani and the latter for haleem. The city also boasts of eateries that grew from just a bandi (handcart) to full fledged multi storeyed cafes and restaurants. Amongst these are the Gokul Chaat Bhandar and Ram ki Bandi. Both worth a visit, for their chaats and dosas. And if you are a vegetarian in Hyderabad, against popular belief, you needn’t despair. For you have an entire street that comes alive every evening and serves up everything from a dabeli or a vada pav to a fruit flavoured soda or a malai kulfi. That is Sindhi Colony for you. It is such a hit among the youngsters for street food that within hours of opening, most of these joints sell out. So be there in Sindhi Colony by five any evening, if you want to try out everything. See the iconic Charminar by the evening lights of the fruit sellers or on an early Sunday morning when it is at its atmospheric best with the Jummeraat Bazaar that pop ups enroute Charminar every sunday. While there, also check out Laad Bazaar, an entire lane dedicated to selling colourful bangles. Nothing else gives you a feel of old Hyderabad like this traditional bazaar. One can also go up a minaret of Charminar to take in the entire old city – the heart of Hyderabad from its balconies. 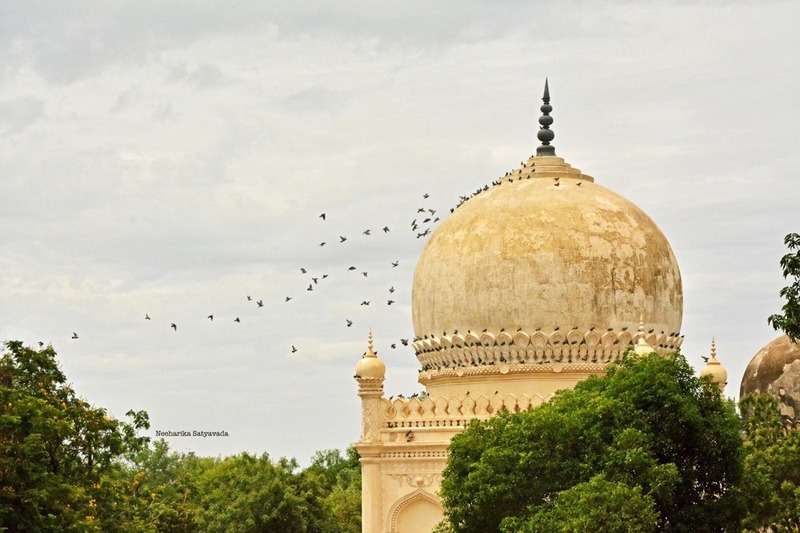 Though they don’t rank high on the typical tourist checklist, the Qutb Shahi Tombs are yet another must visit. Some of the areas of this expansive complex are undergoing restoration, in the hopes of bringing this mausoleum onto the coveted list of UNESCO Heritage Sites. Golconda Fort, believed to be the strongest of the Deccan Forts holds number one spot on every traveller’s Hyderabad itinerary and rightly so. For the earthy brown monument with its manicured lawns isn’t just beautiful. The architectural designs to draw water and even cool the citadel on a hot day are intriguing. Also, the trek up to the summit of the fort is invigorating, specifically around sunset. And when one has had enough of ruins and tombs, then a visit to the Chowmahalla Palace is sure to refresh you with a peek into the the erstwhile life of the Nizams of Hyderabad. Built in a mix of Dravidian and Rajasthani architectural styles, the Birla Mandir is a beautiful marble structure sitting – in all its pristine white splendour – atop a hillock on the banks of the Hussain Sagar. The temple is dedicated to Venkateswara Swamy is a quiet and serene place. Conducted by the Telangana Tourism Department, this guided walk through the lanes of the old city, happens every Sunday from 7:30 am to 9 am. There are four walks to choose from, to explore the architectural and historical splendour of the city, but the walk from Charminar to Chowmahalla Palace remains the most popular. The Sky Show at Birla Planetarium is popular across quite a few of the bigger cities in India, but here in Hyderabad, where it is located on one of the more popular hillocks of the City, the Naubat Pahad, it gives you two additional reasons to visit. One for the sweeping views of the Hussain Sagar and the pristine white Birla Mandir. And the other, for its Science Museum. The interactive science section here at the Museum has been engaging children and adults alike in exploring the basic laws of Physics in a fun way for over 27 years now. And who hasn’t seen pictures of the famous Buddha Statue of Hyderabad, believed to be the tallest monolith of the Gautama Buddha. Take an evening boat ride in the Hussain Sagar to the Buddha. This white granite statue was consecrated by the Dalai Lama himself!